What are coreless DC motors? You are here: Home / FAQs + basics / What are coreless DC motors? A typical brushed DC motor consists of an outer stator, typically made of either a permanent magnet or electromagnetic windings, and an inner rotor made of iron laminations with coil windings. A segmented commutator and brushes control the sequence in which the rotor windings are energized, to produce continuous rotation. A typical DC motor consists of an outer, permanent magnet stator and an inner rotor made of iron laminations with windings. Coreless DC motors do away with the laminated iron core in the rotor. Instead, the rotor windings are wound in a skewed, or honeycomb, fashion to form a self-supporting hollow cylinder or “basket.” Because there is no iron core to support the windings, they are often held together with epoxy. The stator is made of a rare earth magnets, such as Neodymium, AlNiCo (aluminum-nickel-cobalt), or SmCo (samarium-cobalt), and sits inside the coreless rotor. A coreless DC motor does away with the iron core in the rotor. Instead, the rotor windings are wound in a skewed, or honeycomb fashion to form a self-supporting hollow cylinder. The stator magnet sits inside the coreless rotor. The brushes used in coreless DC motors can be made of precious metal or graphite. Precious metal brushes (silver, gold, platinum, or palladium) are paired with precious metal commutators. This design has low contact resistance and is often used in low-current applications. When sintered metal graphite brushes are used, the commutator is made of copper. The copper-graphite combination is more suitable for applications requiring higher power and higher current. Coreless DC motors have a rotor that is hollow and self-supporting, which reduces mass and inertia. The construction of coreless DC motors provides several advantages over traditional, iron core DC motors. First, the elimination of iron significantly reduces the mass and inertia of the rotor, so very rapid acceleration and deceleration rates are possible. And no iron also means no iron losses, giving coreless designs significantly higher efficiencies (up to 90 percent) than traditional DC motors. The coreless design also reduces winding inductance, so sparking between the brushes and commutator is reduced, increasing motor life and reducing electromagnetic interference (EMI). Motor cogging, which is an issue in traditional DC motors due to the magnetic interaction of the permanent magnets and the iron laminations, is also eliminated, since there are no laminations in the ironless design. And in turn, torque ripple is extremely low, which provides very smooth motor rotation with minimal vibration and noise. Because these motors are often used for highly dynamic movements (high acceleration and deceleration), the coils in the rotor must be able to withstand high torque and dissipate significant heat generated by peak currents. Because there’s no iron core to act as a heat sink, the motor housing often contains ports to facilitate forced air cooling. 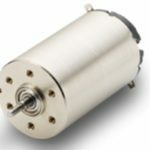 Coreless DC motors are available in both cylindrical and flat (disc) configurations. The compact design of coreless DC motors lends itself to applications that require a high power-to-size ratio, with motor sizes typically in the range of 6 mm to 75 mm (although sizes down to 1 mm are available) and power ratings of generally 250 W or less. Coreless designs are an especially good solution for battery-powered devices because they draw extremely low current at no-load conditions. Coreless DC motors are used extensively in medical applications, including prosthetics, small pumps (such as insulin pumps), laboratory equipment, and X-ray machines. Their ability to handle fast, dynamic moves also makes them ideal for use in robotic applications. What are wound field motors and where are they applied? What’s the difference between cogging torque and torque ripple? Why use brushed servo motors? FAQ: How can brush wear in DC motors be minimized? FAQ: Where do brush DC motors still make sense?